Arguably the cutest fruit, Strawberries have long held a place in the heart of Japan. 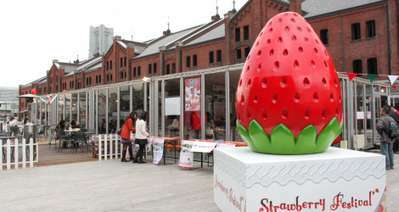 This February, Yokohama’s Red Brick Warehouse will transform into bright red strawberry heaven, with twenty stalls selling a range of local strawberries, berry-themed desserts and jams at the Yokohama Strawberry Festival. Get down early to take advantage of the free farmer’s samples, they sell out fast. There’s also strawberry themed attractions and games for the kids. You’re guaranteed to never look at a strawberry the same way again.